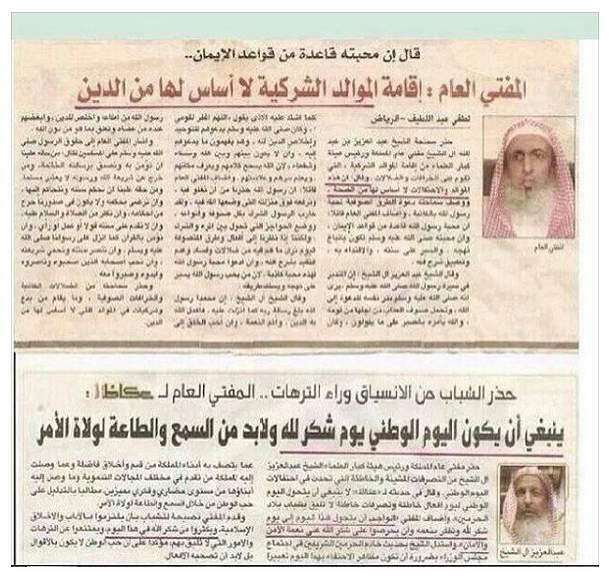 In the top story the Mufti in Riyad says that Mawlids are shirk and have no basis in the deen. In the bottom story he says that the 'national day' (which celebrates the birthday of Saudi Arabia) 'ought to be' celebrated as a day of thanks to Allah. The sub-text here is that the Mufti is 'Abdal'aziz – "Aal ash-Shaykh" – meaning that he is one of the new shareefs, a descendant of Shaykh Muhammad ibn 'Abdalwahhab. So we have to replace celebration of the birth of the Rasul, salla'llahu 'alayhi wa sallam, with celebration of the birth of Saudi Arabia. And we have to replace love of his family and descendants, salla'llahu 'alayhi wa sallam, with love of the descendants of Muhammad ibn 'Abdalwahhab.